As an artist and writer, I specialise in lifelike wildlife and nature inspired paintings and drawings, plus poetry and novels. My professional career began in New Zealand, where I resided for nine years. Since my return to Australia I have been creating new work to launch myself in my home country. While working directly with the Mayor of Auckland City, John Banks, I participated in the Mazda Art Awards, exhibiting a painting of a brown kiwi at dusk. This painting has since been licensed to Jason Products for use on home decor products. I have been awarded places in most competitions entered. Even having Australia’s Ken Done create a new section for the Mosman Bicentennial Awards to enable him to grant me with the title ‘Most Promising Artist’ at age sixteen. Further awards include two consecutive years in the Merriwa Art Awards, attracting entries from around Australia, and ‘Best Natural Fauna’ at The Kapiti Observer Rotary Art Show. Many of my poems are in essence intimate images of the natural world. My poem 'Sleeping Is How We Awaken’ reached the finalists stage of the 2016 Lane Cove Fiction Awards, published in the Lane Cove Literary Awards 2016: an Anthology. I am also crafting a Young Adult novel series, while my unreleased poetry collection on birds will be brought together with artwork to form an exhibition and book after the completion of the current project I am working on. I have held exhibitions featuring birds throughout New Zealand’s north island and been covered in New Zealand local and national press. One of my brown kiwi paintings is the cover for Coromandel Life Magazine Spring 2018 edition with other paintings in the series illustrating an article on the New Zealand Department of Conservation. International sales include to Europe and Asia as well as New Zealand and Australia. My passion for nature is expressed through a number of series including New Zealand and Australian birds and botanical watercolour / ink drawings of Australian Grevilleas. Commissions include a painting of a Brown Kiwi for the Tawharanui Regional Park TOSSI committee to celebrate the work of volunteers and commemorate the opening of a predator-proof fence, plus paintings of endangered birds for an investment art collector, paintings of Australian native animals for a multinational businessman and wildlife drawings and paintings for numerous private collectors. Many of my paintings have been featured in restricted release series of calendars. I have illustrated rare deep-sea shells for scientific journals and provided sketches for speleological journals detailing micro-bats and cave systems. I have been personally invited to participate in the Kiwi Recovery Programme and allowed access behind the scenes to photograph New Zealand native fauna for reference in my paintings. The current long-term project is the creation and exhibition of a body of artwork with the ultimate goal of a published book. The contents will include my art and writ ing, alongside messages from notable people around the world. Both the exhibition and book will highlight the global decline in animal species diversity and Why it matters. 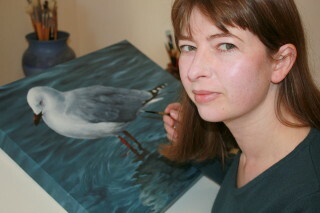 Naturalists and conservationists like Sir David Attenborough and Don Merton have given direction to my work. My meetings with Sir David Attenborough over the years as an avid admirer and my own engagement in nature have cemented my desire to depict the wildlife around us. 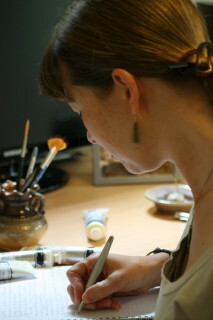 This I have faithfully been doing since I first began drawing and writing as a young child. Self-taught, it is through dedicated practice that I have learned to write and to illustrate wildlife. And it is a subject matter that will remain close to my heart. Works may be viewed & purchased by visiting my website www.mccolyer.com or New Zealand representing galleries; Next Door Gallery, 132 Hinemoa St, Birkenhead, Auckland, Artel Gallery 76-78 Main Road, Waikanae, Kapiti Coast and Kiwi Art House Gallery, 288 Cuba St, Wellington. If you like my work, please follow me on Facebook (marieclairecolyer) and Instagram (mccolyer). 'Whether it be a spider or a leopard, there is a beauty inherent in nature. It is this that I strive to capture; to connect with the essence of my subject. To wrest the spirit of the animal from blank canvas and watch it manifest like the quickening of a candle flame to a blaze of light. I work primarily from my own photographs, taken in the wild or when necessary at Zoos and animal sanctuaries. I find studying the animal first-hand better infuses my work with a sense of its movement and habits. This knowledge comes across in the paintings in the way an animal might sprawl or the direction its feathers might lie. Likewise, I like to have touched the animal, to feel the sleekness of its pelt or the crevices in its hide. Things like that do make a difference in the way I paint. For instance you would expect north island brown kiwi feathers to be soft; however they are bristly. This is in contrast to great spotted kiwi whose feathers are downy at the base. Yet they are both kiwis. When painting these birds I now know to create this distinction, which I would not have done had I not felt these plumages for myself. Once back in the studio, I sketch onto archival watercolour paper or canvas. For a full painting I block in the animal with a solid colour. Next I paint the background before returning to the animal. I like to capture the details of the eyes as early as possible. I find it is not until the eyes come to life that the animal breathes. If the eyes connect with the viewer then I know the painting will work. Often I will have an animal that is barely represented but the eyes are done and the animal is alive. My favourite part of painting is the final details; the highlights and shadows that give a work that extra dimension. I strive to bring a realism and life to my work. My hope is that the viewer will bond with the painted animal the same way I do while painting it.